Amiel (17.2.2009) - Griffon vulture (Gyps fulvus). Machine nr. 001. Mint ATM small value (NIS 1.60). Amiel (17.2.2009) - Griffon vulture (Gyps fulvus). Machine nr. 001. 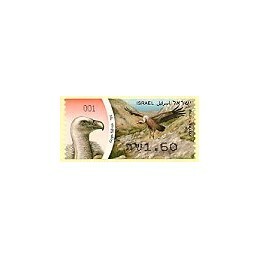 First day cover, inland postage (NIS 1.60). Amiel (17.2.2009) - Griffon vulture (Gyps fulvus). Machine nr. 001. 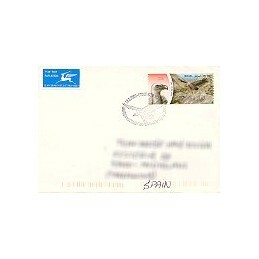 First Day Cover posted to Spain (NIS 3.80), postal indexation. Amiel (17.2.2009) - Griffon vulture (Gyps fulvus). Machine nr. 001. 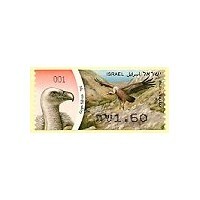 Maximum card with ATM, inland postage (NIS 1.60). ISRAEL (2009). Griffon vulture - 001. Set 4 val. Amiel (17.2.2009) - Griffon vulture (Gyps fulvus). Machine nr. 001. 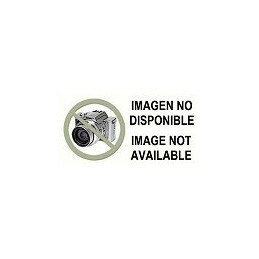 Mint set 4 values (NIS 1.60-3.20-3.80-5.60). ISRAEL (2009). 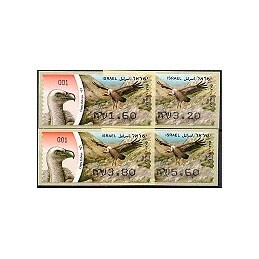 Griffon vulture - 001. Set 8 val. Amiel (17.2.2009) - Griffon vulture (Gyps fulvus). Machine nr. 001. Mint button set 8 values (NIS 1.60-2.30-3.20-3.50-3.80-4.40-5.40-5.60). Amiel (17.2.2009) - Griffon vulture (Gyps fulvus). Machine nr. 006. Mint ATM small value (NIS 1.60). Amiel (17.2.2009) - Griffon vulture (Gyps fulvus). Machine nr. 006. 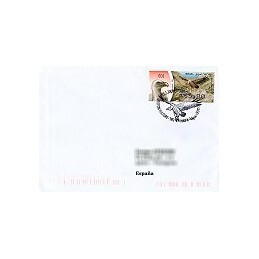 Cover posted to Spain, new postal tariffs - July 2009 (NIS 4.60). Amiel (17.2.2009) - Griffon vulture (Gyps fulvus). Machine nr. 006. 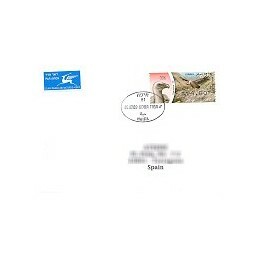 First Day Cover posted to Spain (NIS 4.40), postal indexation. Amiel (17.2.2009) - Griffon vulture (Gyps fulvus). Machine nr. 006. Mint button set 8 values (NIS 1.60-2.30-3.20-3.50-3.80-4.40-5.40-5.60). Amiel (17.2.2009) - Griffon vulture (Gyps fulvus). Machine nr. 006. 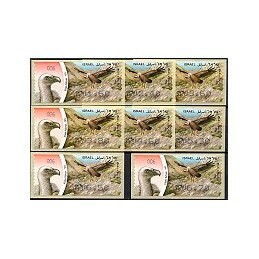 Mint button set 8 values - new postal tariffs (NIS 1.60-2.40-3.60-3.80-4.60-5.30-6.50-6.70).